Just like previous recalls before it — salmonella-tainted milk powder, flour-contaminated with E. coli, and listeria-infected cookie dough — the recent listeria contamination of certain cheese from Deutsch Kase Haus has spread to include a number of companies and products, including Meijer and MDS cheese and snacks. Once again, the recall of a common food ingredient has provided us with a behind-the-scenes look at how food companies work together to create our favorite snacks. In this case, Deutsch Kase Haus cheese used by a number of other companies has contributed to the recall of several products. The recall began last week when Deutsch Kase Haus recalled the speciality Longhorn Colby cheese it supplied to Sargento after determining it was contaminated with Listeria Monocytogene. The cheese was used in two Sargento products — Ultra Thin Slicked Longhorn Colby and Chef Blends Shredded Nacho & Taco Cheese products. 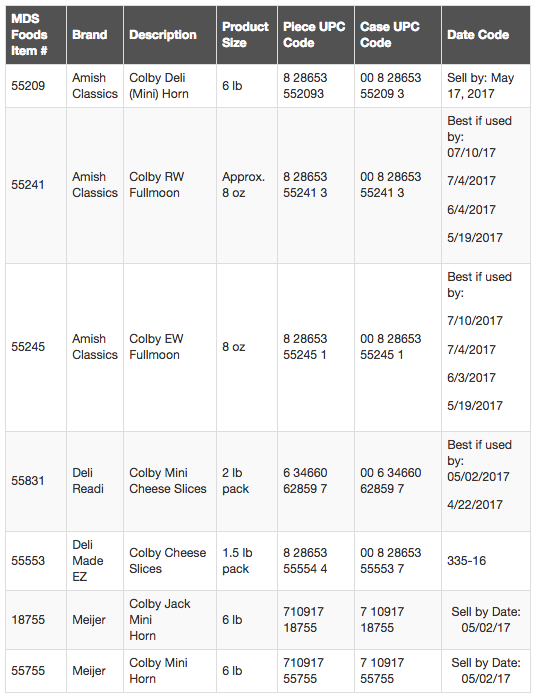 These products were made on the same line as five other products that Sargento voluntarily recalled. It just so happens that the recalled Sargento cheese was also used in certain Taylor Farms pre-made salads, which have also been recalled. Sargento’s products, we learned today, were also used by Country Fresh LLC in a number of cooking and snacking products, including four types of stuffed mushrooms and fruit and cheese snack containers. According to a notice posted to the Food and Drug Administration, the products were sold in Alabama, Florida, Georgia, Kentucky, Louisiana, Maryland, Mississippi, North Carolina, South Carolina, Tennessee, Texas, and Virginia under the Country Fresh and store brand labels. So far, Country Fresh says it is not aware of any illnesses related to the potential contamination. Like Country Fresh, Choice Foods announced the recall of a very limited number of stuffed mushrooms that may contain contaminated cheese from a third-party supplier. It’s unclear if the cheese is from Sargento or Deutsch Kase Haus. 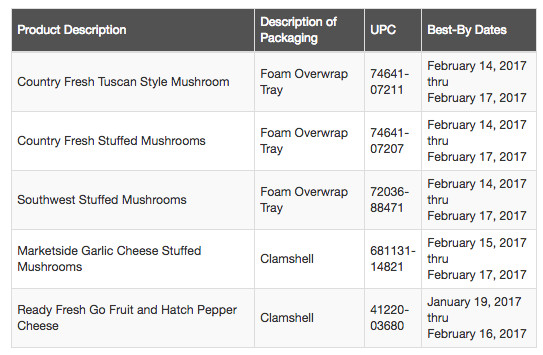 The recall pertains to a just seven trays of individually-wrapped mushrooms in the following flavors: of Traditional Gourmet Portabella Mushrooms; Pizza Style Portabella Mushrooms; and/or Stuffed Mushrooms. The products were sold on Feb. 10 at select stores in Texas and Kansas. Finally, MDS Foods announced recently that it was also notified by Deutsch Kase Haus that several of the cheese products it produces may contain the listeria-contaminated cheese. According to a notice posted with the FDA, the contaminated products were distributed to a number of retailers under several brand labels, including Meijer mini horns and Amish Classics deli cheese. Additionally, the company says it would recall a number of products that might have come in contact with the contaminated cheese. The full list of recalled products can be found here. Customers who have purchased any of the cheese products are urged not to consume it and to return it to the place of purchase for a full refund. Next Why Are Greeting Cards So Expensive, Anyway? Next Up: Why Are Greeting Cards So Expensive, Anyway?